The book mostly consists of feast preparations, of which a few are conspicuously missing – kachories, barats and yoghurt, some sweets (listed in the sweets section), etc. – because I am not expert at preparing them. Some ordinary daily preparations are also listed (dals, rice, chapatis, okma, several vegetables, etc. ), but as daily prasadam should be simple, most of the art is in special preparations for feasts and for the Deities’ plate. 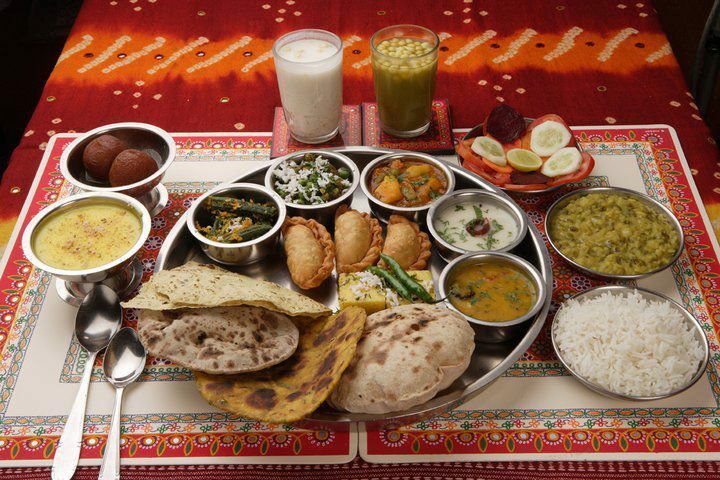 For daily prasadam Srila Prabhupada has told us that milk and milk preparations (at least one pink of milk per devotee per day), vegetables, dals (these latter two can be prepared together if more complex cooking isn’t convenient), chapatis, and fruits are the basic necessities. Rice is to be added in hot climates, and is not forbidden any time, nor are any other simple preparations of grains (cereals, etc.). The daily diet should contain more ghee or butter and general richness when the weather is very cold, less when the climate is warmer. Many sweets and fried preparations, while transcendental when offered, also have passion producing effects in the body. Particularly, brahmacaries (celibate students) should take very little sugar. They are also wise to go relatively easy on spices, ghee, peanuts and chickpeas (and other very high protein foods) and quantity generally – especially if they are troubled by lust and/or anger. If this kind of dietary restraint plus full engagement in devotional service does not solve the problem, then marriage is in order. Srila Prabhupada once said we should be austere in eating for 6 days of the week and feast on Sunday. He has also said about feasting that “our eating should not cause death” (meaning excessive sleeping), nor is too much eating of rich foods worth subsequent passion, and grogginess the next day. The best policy is to prepare the feast very nicely for the pleasure of the Lord, the devotees, and the guests, and later relish the remnants for point of satisfaction, but not to excess. This kind of restraint is only possible when we remember that we are eating prasadam, and not food, and that real happiness comes through service, and not through sense gratification. Part of devotional service is to accept only Krishna-prasadam and to relish it as the mercy of the Lord. To repeat the prayer “This material body is a lump of ignorance” before eating prasadam is very helpful in this respect. A few things we don’t eat as Vaisnavas are onions, garlic, chocolate, mushrooms (not forbidden, but not offerable to the Deity), soybeans, masur dal (red lentils), yeast – and, of course, meat, fish, eggs, and alcohol. Some spices Srila Prabhupada has nixed are mustard seeds, mustard oil (useful for toothpaste and skin), and fenugreek seeds. Cooking oils are never better than third class, and should never be used in cooking for the Deities, unless ghee is truly unavailable. Srila Prabhupada has never shied away from the use of white sugar, nor has he shown any interest in today’s ‘health food’ or ‘zen diet’ theories, nor has he been overly fussy in investigating the background production or processing of foodstuffs. The principle is that there is nothing produced in this contaminated age that is pure, and that if the foods are those we accept, we treat them properly once we have them, and purify them by offering, without so much worrying about their background. If what is there is sugar, for example, we don’t’ worry how it got that way. Simply, once we have it, we prepare with it and offer nicely, and leave the rest to Lord Krishna. With this bit of basic philosophy covered, we can proceed to the practical basics and terms used in the recipes. The basic spices I keep with me (these are not the only useful ones), along with their Hindi names (when I know them), are turmeric (haldi); salt; asofoetida (hing); cumin seeds (jira); anise seeds (sauf); coriander seeds; whole cardamom seeds (ilachi); whole cloves; ground cinnamon and ground nutmeg; rosemary; and thyme. Some others that are useful sometimes are ground coriander; ground cloves; bay leaves; saffron; camphor; and lavajis (Gujurati) or joyan (Bengali) for which I know no English name-equivalent. When I chaunce, I begin by heating ghee (clarified butter) in the bottom of a pan over medium-high heat. If using coriander seeds, these go in first. Once these are beginning to brown, then cumin seeds. Once the cumin seeds are browning, then broken up red peppers. Once these are turning black, then (if using) anise seeds. When these are golden brown, then sprinkle in the asofoetida, and immediately afterward add the foodstuffs or pour the chaunce into the dal or cuddy. When the chaunce is ready, the coriander and cumin seeds are deep brown (never burnt black), the red peppers are black, the anise seeds are medium brown, and asofoetida has just been added (asofoetida should always be sprinkled in, or else it merges into lumps in the ghee). A proper chauncing is one of the keys to nice vegetable preparations, chutneys, dals, and many others. For steaming vegetables, the technique is to put the vegetables in a pot, and add from ¼ to one inch of water at the bottom. Put on a tight lid, and let the water boil out, stirring a couple of times in the process. Different vegetables take different times to steam, and the art is to add just the right amount of water so that just as it cooks out the vegetables are just soft through. An arrangement (like a double boiler) that suspends the vegetables above the water, while exposing them to the steam, is the best. This method of pre-cooking is far superior to boiling, which causes loss of nutrients. Concerning spicing, I have never been one to measure spices by teaspoons, tablespoons, etc. Hence you will not find exact measurements in the recipes. Srila Prabhupada spices by pouring the spice into the palm of his hand, appraising the amount, and then adding it to the preparation. Especially at first (and especially with salt), it is better to be a bit conservative. You can always add spices, but it is generally impossible to remove them once in. Mastery in spicing means that the preparation is spiced just sufficiently to fully enhance the flavour of the main ingredients. Each time you prepare something you can learn by tasting the remnants the way to improve your spicing of it the next time. With the exception of the undesirable foods pre-listed, most fruits, grains, vegetables, etc. can be made into first class preparations. Cabbage is generally second class, but can be prepared nicely in certain ways. I find that turnips, parsnips, swedes, spring (loose-head) cabbage, and a few others are generally third to fourth class by nature, and I usually don’t cook with them. Artichokes are out (too troublesome). We don’t generally have much use for grains other than wheat, rice, and occasionally oatmeal and cornmeal. Srila Prabhupada has complimented nicely prepared broccoli, and I have also observed him to enjoy properly prepared grapefruit (both these were once thought taboo). Properly prepared grapefruit means not only to remove the outer peel, but also the skin on each segment, and to offer the internal membrane with a little sugar. Srila Prabhupada has never shown excessive fondness for salads made of raw vegetables, although he will take them on occasion. Of course, the general principles are to keep Krishna’s kitchen as clean as His temple room and to be very clean in body and mind while cooking. Clean of body means to wash hands before cooking (and when possible, bath first and wear clean clothes), and also each time you touch your clothing or body, the floor, or any dirty object. If you drop foodstuffs, those that can be thoroughly washed can be used, but otherwise they are not offerable and should be discarded or eaten without offering. No eating or drinking should take place in the kitchen. Animals and bugs are undesirable guests, as are non-devotees who don’t understand that prasadam is not to be relished by seeing, smelling or tasting before it is offered to the Lord. Cleanliness of mind means to offer obeisances to Srila Prabhupada before beginning, and to discuss only the cooking and Krishna Katha while in the kitchen. Generally less talking means less burning and spoiling of preparations. Basically, then, a good cook means he is very clean and very aware of his responsibility as a cook for the spiritual master and the Deities. Krishna helps such a servant to cook very nicely. The techniques of cooking prasadam are as transcendental as the offering process. Prasadam cooking is not just another theory on vegetarian diet, but is the style in which foodstuffs are actually prepared for Krishna in the spiritual sky. Therefore, we should stick to the standard approaches and try to make them perfectly. This will make the prasadam very pleasing to the Lord, and automatically the best tasting of all foodstuffs, especially for those who are balanced toward the mode of goodness. The following are only a few of the unlimited transcendental preparations possible. Wash dal and drain, spice mildly with turmeric, salt, ground black pepper, bay leaves, (rosemary, sage optional), add four parts water to one part dal and boil. Chaunce mildly with cumin seeds, anise seeds, red peppers, and asofoetida (hing). Wash dal, drain and spice medium with turmeric, salt, black pepper, bay leaves, sliced ginger root, a little cinnamon, cloves, and nutmeg. Add 5 parts water to one part dal and keep at rolling boil. It takes a long time to cook. Chaunce, medium strength with cumin seeds, a few coriander seeds, red peppers and hing. Wash and drain, spice the same as for Channa Dal, also putting some rosemary and thyme and chopped tomatoes. Add four parts water to one part dal and keep at rolling boil. About half an hour before done, adding small chunks of cauliflower is nice. When beans breaking open and liquid becoming soupy, done. Chaunce with a few coriander seeds, medium cumin seeds, light on anise seeds, red peppers and hing. Wash beans and drain, spice lightly with turmeric, salt and black pepper, put rosemary and sliced ginger root and a good sprinkling of cinnamon, nutmeg, and clove powders. Add 3 ½ to 4 parts water to 1 part dal. About 1 hour before done, add plenty of apple chunks. Chaunce with light cumin, fairly heavy anise seeds, medium red peppers, and light hing. Near the end add about a quarter cup of sugar for every cup of dal beans used. Should be slightly sweet and quite thick – almost pasty. I have experienced that Srila Prabhupada is much more interested that dals are properly spiced and sufficiently cooked, rather than in their thickness – I usually make all dals fairly thick and cook the beans until they are breaking up and making the liquid thicken. Channa I do not make so thick because it is very high in protein. Sometimes in 2, 4 and 5, I go light on the ground black pepper, and add also some whole peppercorns; also, in five, whole cloves instead of ground. 3 should be spiced lightly and simply just to accentuate and bring out flavour. 5 is nice change now and then, usually very popular and 1, 2, and 4 are good for most days – vegetables can also be added liberally to these if one likes. There is one special dal using whole chickpeas which is good for big S.K.P. (sankirtan party) days or feasts: Boil whole chickpeas until soft when squeezed. Drain off water and add buttermilk to the top of beans. Mix in a little gram (chick pea) flour – enough so that as the buttermilk comes to boil, it thickens a bit. Spice with turmeric, salt, light on red peppers, and plenty of hing. Wash equal proportions rice and dal and drain thoroughly. In the bottom of a deep pot make a chaunce with plenty of ghee, adding medium amounts of coriander seeds, cumin seeds, red peppers and hing – when seeds are deep brown add grains and stir. Add ghee until it is almost running out the bottom (Srila Prabhupada: “Kittrie means ghee”). While stirring over medium flame add turmeric, salt, black pepper, thyme, rosemary and a light sprinkle of ground cinnamon and nutmeg. At this point fairly big chunks of potato and cauliflower should be added (chopped tomato and other vegetables optional), and mixture should be stirred until rice is looking well fried. Then add water in this proportion: 1 part rice, 1 part dal, 4 parts water. Bring to a boil, and then turn down again to a low boil, covering tightly with lid, and steaming like rice. Give it one stir when water has gone down to top of rice, thus mixing ingredients, otherwise disturb as little as possible. When water is gone check to see that rice and dal are soft to touch, if not, add a bit more water. If this preparation is made with less spice or just salt and turmeric, and ½ again more water is used, it can be stirred while cooking and made into a runny kind of kittrie that is very good for weak or sick stomachs – this should be taken (if for medicine) with no chapaties and only boiled or steamed vegetables. Prepare rice and mung the same as for regular kittrie, and fry the same way but no chaunce. Spice and salt and turmeric, and while frying add chunks of cauliflower and potato. When dal appears a bit glassy add water in the same proportion as for regular Kittrie and cook in the same way, exactly until done. At the same time this is cooking, put one part sifted gram flour in the bottom of a deep saucepan, add a moderate sprinkle of turmeric and salt, (it takes some practice on the turmeric), and then mix in a little water, beating into a pasty batter so that lumps are stirred out. Then add four to five parts yoghurt (4 if very thick, 5 if thinner) and beat this into the batter. When all lumps are gone, add water slowly, stirring constantly until the batter has become nearly like water. If turmeric has been right this liquid should be white with a light yellowish caste, not bold yellow. Then bring this mixture up to a boil, being careful because it burns easily and even a little burning spoils cuddy sauce. As it gets near boiling it should turn yellow and almost simultaneously thicken into a thick liquid (gravy-like). When boiled, finished. Chaunce with fairly heavy cumin seeds, very light red peppers, and heavy hing. When offered or served poured over the kittrie this is one of Srila Prabhupada’s favorites. Wash rice at least twice thoroughly and drain. Put in pot with a small quantity of salt and two parts water to one part rice. A little more water if Basmati or some other hard variety. Bring quickly to a boil and then turn heat down until barely boiling, and put lid on. The best thing is not to disturb rice while cooking – but if it is a very big quantity or the pot is too small, then check it once rice is showing above water to make sure it is cooking evenly. If not, stir gently occasionally until nearly cooked, and then stop stirring completely. The rice should be cooked – soft and fluffy – when the water is gone. Then stir once gently and offer hot – plain or with a little butter on it. It can be offered along with some plain yoghurt – because the two mixed is very palatable. ‘Kesing’ – cheese balls – boil 12 pints of milk, when boiling pour in lemon juice or tartaric acid solution slowly while stirring – when milk separates into curds and whey stop, and strain out curds thru a cloth, saving whey and keeping. Squeeze the whey out of the cheese by twisting in the cloth until cheese is nearly dry but still a bit moist with whey. Then roll the cheese under a rolling pin, thoroughly smashing the curds until the cheese is smooth. Then compress this cheese into small, firm balls less then ½ inch diameter, and keep them aside. Then crack open a good sized coconut or two smaller, putting the water in the whey. Pry out the white meat with a knife in as large pieces as possible. Slice these pieces into wedges 1 to 1 ½ inches long and one-sixteenth to one-eighth thick, after scraping the brown off the back. Have 1 to 1 ½ lbs. Whole cashew nuts, or, alternatively, whole blanched almonds on hand. Now – deep fry all these items in ghee – best thing is to have them in a wire mesh basket or big strainer and dip this into the ghee, removing when they are done and draining to save ghee. The coconut wedges and nuts should be fried until just golden-brown, and the kesing balls until rich brown and hard on the outside. Keep these fried goods aside along with 1 to 1 ½ cups golden raisins. Next – wash 4 lbs. of basmati rice (or highest quality available) checking first for pebbles. Drain thoroughly. In the bottom of a deep fairly big pot melt some ghee and make a chaunce – medium strength, with coriander seeds first, then cumin seeds, then red peppers broken, then anise seeds, and right at the last, plenty of hing sprinkled in and a few bay leaves. Right on top of the hing and the bay leaves toss the rice, and stir, adding some ghee until rice nicely glistening with it. Now fry over medium heat, stirring occasionally, and adding: turmeric, salt, black pepper – all medium – plenty of rosemary (crumbled in hand first to free flavour), liberal sprinklings of cinnamon and coriander powder, a bit less clove powder (very strong), and especially lots of ground nutmeg, which is very nice in this preparation. Stir this mixture around until the rice is just a bit browned, and then add the fried goodies and raisins. Stir once gently and then add about 9 pints (a bit more than two to one) of the whey and coconut milk mixture – supplement with water if necessary. Add now one to 1 ½ lbs. Sugar, and break open 10 to 15 cardamom pods, breaking the enclosed seed-lumps into the liquid. Bring quickly to boil and then turn heat down to low boil and cover tightly, cooking like plain rice. Again, when rice beginning to show above water, check to see that it is cooking evenly, and if not stir gently and re-cover. If problem, then stir once again gently when half of remaining water is gone. When water is gone, see that rice is soft – if not, add a bit more whey or water, but it should be done. If not already mixed, then stir once to mix all ingredients and fluff up. While stirring be careful of kesing balls. Offer as is. This preparation is nearly a feast in itself. I’ve had it twice cooked by Srila Prabhupada – an unforgettable taste – and this recipe approximates that taste. This recipe feeds 50 usually, so proportions can be adjusted to suit. Take plain whole-wheat flour – smooth ground is best – and add a little salt. Mix in warm water, kneading until you have a dough which is neither quite sticky nor stiff. Then go on to knead this dough thoroughly for at least 5 minutes, and after that let sit – covered with pot or damp cloth for 15 minutes – do not allow to dry out on outside. Avoid kneading dough again after letting sit. Then make some balls – maybe 1 ½ inches diameter – recovering the rest and rolling the balls in flour. Spread some flour on the rolling surface, and press a ball down with hand in the middle of it. Roll out into a thin circle one-eighth of an inch or less thick. Try to perfect rolling nice circles of uniform, thin-ness, turning over and re-spreading flour when necessary. Use as little flour as possible for rolling and brush off the chapati gently before cooking to remove excess flour. The more flour on the chapati, the more it tends to become tough. To cook – have a hot plate, griddle, or cast-iron fry pan (or Indian chapati-circle) hot above a low to low-medium heat, on another burner have a medium to high heat, and a way to suspend the chapati above it and then turn it – directly above the heat source (sometimes stacking two burner grills accomplishes this – in India they heat the chapati on a hot cast-iron circle and then toss it right on the hot coals and flip it once to puff it). Then put the chapati on the hot surface (normally, it will not stick) and let it heat until it just begins to bubble – then flip and let it bubble just a bit more – then put directly over heat – it should then puff up like a basketball – and flip immediately. Brown (not black) spots should form a bit on both sides. Then brush with melted butter and offer or serve hot – right off the flame whenever possible. If served fresh like this, with plenty of butter, the taste is incomparable. Srila Prabhupada likes them thin and around 8″ in diameter. Take either whole-wheat flour or 50% white (chapoories). Melt ghee (try ¼ lb. Melted ghee to 2 lbs. Of flour) and work warm ghee into the flour. Srila Prabhupada told me that good poorie dough means some ghee (so it will not need flour to roll), but not lots of ghee. Minimum ghee is better. When ghee pervades flour, then start kneading in warm water to make a stiff dough. Knead thoroughly until smooth and then let sit 15 minutes covered. Again make balls – this time smaller, 1″ diameter. Rolling pin and surface should first be smeared with a bit of ghee (minimum) and then roll out some nice, round circles, very thin. If sufficient ghee in dough, no flour is needed, if not, work in more ghee – don’t use flour to roll poories. 1. If to be offered and served up immediately, then have ghee quite hot and roll the poories fairly small and very thin. Put them in the ghee (remember, hot ghee is extremely hot and burns severely). They will puff immediately. Immediately flip and then quickly remove from ghee, offering or serving while hot is best. In this way they will stay soft, but because they are thin they are cooked nicely. 2. If to be put aside and distributed later – say at an engagement – then roll them a bit thicker – up to one-eighth inch – and cook them in ghee that is hot but not extremely hot. Putting them in ghee, they will also puff up, but a bit slower, when puffed, flip for a couple of seconds. The idea here is to cook them until they are beginning to stiffen, but are not yet brittle and crumbly. Then drain them, and finally stack them up in a pot or box, on top of each other, and keep a lid on the container as much as possible while cooking them. In this way they are cooked sufficiently and their weight and heat will collapse them one atop the others. Still soft, warm, and palatable, they can be served up hours later if desired. The same approach is used in making the dough – stiff and not too much ghee. Then they can be cooked in medium-hot ghee – thin but not extremely thin, and after puffing and flipping, but not yet showing any brown, they can be removed, drained, and sprinkled with granulated or powdered sugar mixed with a bit of salt (10 sugar, 1 salt) – a delicacy. Make dough as in No. “2”, but before adding in water, mix in turmeric, salt, and fine ground hing (plenty of latter), and also some tiny Indian seeds (like anise in appearance, but only one-third as big) called “lavajin” – (these seeds have a unique taste unlike cumin or anise – this name is Gujarati or Hindi – they have different names in different Indian languages). Then complete the dough and cook like regular poories. Filling: clean cauliflower and then chop into small bits (I usually whittle down the heads with a knife – all the way down to the tough centre). Then make a chaunce with plenty of ghee, adding medium-large quantities of coriander seeds, cumin seeds, dried red peppers, fennel seeds, and much hing at the very last. The cauliflower goes in right on top of the hing. Stir, and add in liberal quantities of turmeric, salt, black pepper, rosemary, thyme, and very important, ground cinnamon, nutmeg, coriander, and a bit of ground cloves – also add in some butter, to increase richness and speed cooking. When cauliflower nearly cooked (glassy) add fresh or frozen peas and finely chopped spinach. (Sample proportions: 5 or 6 good-sized cauliflowers, 2 lbs. peas, 1 lb. spinach, ¼ lb. butter). Stir around for a few minutes (all through frying, heat can be high as you like, but don’t burn), and then add water until not quite showing above vegetables. Then cover and let the water steam out, stirring occasionally and not burning. When peas nicely cooked remove lid and cook off any excess water. When mixture is moist but water not running out bottom, finished. Mash into paste. It is easier to stuff samosa’s when the filling has cooled. Samosa filling should be fairly spicy, but not so hot the karmies can’t eat them. Dough – for the above quantities of vegetables approximately 4 lbs. white flour, put in a pan. Melt 1 lb. ghee, and when nice and warm, thoroughly blend all this ghee into the flour, so that flour is pervaded with ghee. Then mix in warm/hot water a little at a time, while kneading, until a smooth but stiff dough is formed. Knead thoroughly, and then cover for a few minutes. In this way, samosa dough, unlike poorie dough, means lots of ghee – the more ghee and less water used in making, the softer and more palatable the samosa crust – some water is however necessary. And, according to Srila Prabhupada, samosa dough should be made with white flour, not whole wheat. Make sure all seams are well sealed so they don’t break open while frying. Then deep fry in hot ghee until a rich golden colour, and offer. Excellent at feasts and engagements. Clean potatoes thoroughly and cut into fairly large chunks of uniform size. Put in a pot and add a super-large amount of turmeric (much more than you think) – then add water to just above top of potatoes and boil with lid on until knife passes easily through the potato chunks. Then drain off the liquid thoroughly. Usually, Srila Prabhupada does not like vegetables to be boiled, but he has allowed me to do this with potatoes. (Steaming is O.K.) They will soak up turmeric and look yellow-orange when cooked. At the same time spuds are cooking, chop up cauliflowers into fairly small, whole pieces (for 10 lbs. potatoes, use 3-4 medium cauliflowers, and at least 2 pints of sour cream). Now, in a suitable frying pan make a chaunce with plenty of ghee. Make a strong chaunce, enough for potatoes as well as cauliflowers. Proportionately – medium coriander seeds, heavy cumin seeds, medium red peppers, heavy hing – but all together, quite strong. Add in the cauliflower, being careful of the explosion, and stir. While frying, add in enough butter so that vegetable does not stick and fries quickly. Let the cauliflower brown a bit, then stir, etc. until cooked. When cauliflower bits cooked through, add in a quarter to half lb. of butter to melt, and then pour everything over potatoes. Add salt and black pepper – potatoes take a lot of both – but not too much. You can always add salt, you cannot take it out. Add the sour cream. Now take a spatula or flat spoon and press it into the preparation again and again, dicing up the potatoes. Then stir thoroughly, mixing together all ingredients. The result should be yellow and a bit creamy and tastes super-excellent. Some yoghurt – say one-third as much as sour cream, can also be put, optionally. Yoghurt and milk can be used instead of sour cream, but are not nearly as good. 1-b – turmeric potatoes – if potatoes are boiled as above in turmeric, and drained they can then be fried in a similar chaunce, adding salt, pepper and butter for a few minutes, and then offered as a simple, daily preparation. Some milk, yoghurt, or sour-cream can be added to make it more creamy. Wash and peel potatoes and cut in chunks about 1 ½ inches square. Wash similar quantity of cauliflower and cut in sections about same size. (sub-heads). In hot ghee deep fry the potato chunks until golden on outside and soft through. Deep fry the cauliflower chunks in very hot ghee, but only until about half cooked. Drain thoroughly while removing from ghee. In a pot make a medium chaunce with a few coriander seeds, cumin seeds, red peppers, and plenty of hing. Not too much ghee needed in the chaunce. When chaunce ready throw a pint of water in. Then add the potatoes and cauliflower, and add water to barely cover vegetables. Spice with turmeric, salt (moderate) and a little black pepper. Rosemary and thyme optional. Bring to boil, and cover, boiling for about one hour. Then serve in a bowl with the soup. When I offered this (including herbs) to Srila Prabhupada he singled it out as “very nice”. Clean sprouts and cut in half through stem. Clean cauliflowers and cut into medium size chunks (sub-heads). Make a mild chaunce in a pot with medium ghee, a few coriander seeds, cumin seeds, red peppers, and fair-to-heavy hing. Add vegetables (both together) and fry around over medium-to-high heat, adding butter or ghee if they are sticking too much. While frying add medium turmeric, salt, and ground black pepper. Fry and then stir until sprout leaves are browned just a bit, and then add water to just cover vegetables. Cover and boil until sprouts are soft and turned light green, and cauliflower chunks are soft enough to break up while stirring. Finished. Offer in bowl with juice or poured over plain rice. One of Srila Prabhupada’s favorites. Feast or daily. Cut eggplants into small chunks. If your fry-pot is small, figure 2 to 3 times as much eggplant as it appears it will hold (as eggplant cooks down, you can add more and more). Make a chaunce with lots of cumin seeds, medium reds, and medium hing, and plenty of ghee. When chaunce ready, add eggplant bits and stir. Add plenty of turmeric, medium salt (not too much, eggplant is sensitive to salt), and medium black pepper. Have on high heat. Let sit for a while until brown and just beginning to stick – then stir, scraping bottom of pan. Then let sit again, and keep repeating this process. If not cooking very quickly or thoroughly, add more butter or ghee – this preparation requires plenty. When eggplant chunks are soft through and beginning to mush up, add tomatoes chopped into six or 8 pieces. (If tomato skins have first been removed by scaling the tomatoes quickly in boiling water or turning directly in gas flame, this is nicer – no rolled-up skins later). Figure 2 medium size tomatoes to one medium sized eggplant. Stir these in, and also, optional, add a bunch of chopped-up spinach (tough stems excluded) at the same time. Water will come out of the tomatoes, and the whole thing will become soupy. Now start boiling out of the water, letting sit, then stirring. As water cooks out it begins to thicken. Watch out you don’t burn at this stage. Then, when all loose water is gone and the whole thing is an un-recognizable, almost dry, pasty substance, finished. Options are to (1) put in slices of zucchini squash (corgetttes) with the tomatoes (2) to mix in boiled potato-chunks at the end (3) to thoroughly cook chickpeas and then deep fry them in very hot ghee until a bit crisp on the outside but still soft inside, and then mix in at the end. But plain eggplant and tomatoes, or with spinach, is sufficient in itself. This makes a nice noon meal along side kittrie and cuddy and chapatis. It is a very big hit at feasts, especially with devotees and devotee-types. You can often recognize a potential devotee by the way he goes after this preparation. Flat karmies don’t always care much for it. At one time Srila Prabhupada was eating this every day. Clean sprouts and cut in half thru stem. If you like, also wash and shred some cabbage. Put sprouts (and cabbage) into a pot and add a little water up to, say, half an inch deep at bottom. Then put on high heat with tight lid so that water boils and steam cooks the vegetables. Stir 2 or three times while steaming. The art in steaming is to put just enough water so that when it is gone the vegetable is just cooked. Less water at first is better than too much, because you can add a bit, but if you have to drain you loose food value in the water, and Srila Prabhupada does not like this. When loose water gone and sprouts just soft thru; cooked. Now make a mild-medium chaunce with very light coriander seeds, medium-heavy anise seeds, medium reds and hing. Add the vegetables, along with medium turmeric, salt, and pepper. While frying, add some butter to make moist. Fry a few minutes to cook turmeric, then done. Many vegetables can be cooked similar to this. If you want to cook plain cabbage (I have never seen Srila Prabhupada request or eat much cabbage), to do it in this way is as good as any, but at the end mix in a good sprinkling of coriander powder and let sit for a few minutes (zucchini squash – corgettes – can be sliced and steamed with the brussel sprout prep. If you want you can skin a few tomatoes, chop them, and throw them in the chaunce just a few minutes before the sprouts – makes a wetter tomato flavoured preparation. Prepare the cheese the same as for pushpanna, breaking up the curds with a rolling pin (smash thoroughly ) and then put into a firm layer about ½ inch thick. Cut this layer cross-cross, making squares about 1 inch on a side. Deep-fry these squares in hot ghee until rich brown in colour and keep aside. Remove the skins from some tomatoes and chop in 6 to 8 pieces each. Make a medium-heavy chaunce with a few coriander seeds, cumin seeds, lighter red peppers, hing. Put the tomatoes in the chaunce, adding plenty of turmeric, medium salt and pepper, rosemary, thyme and basil. Cook down, stirring frequently, into a thick tomato sauce. Have a large amount of spinach cleaned, stems removed, and chopped up in fairly small bits. At the same time tomato sauce is cooking, put some ghee (a little) in the bottom of a pot, and add the spinach. Cook, stirring occasionally, until the spinach is thoroughly cooked. Whenever water forms, drain it off into the cooking sauce, so that spinach remains almost dry. When the spinach is thoroughly cooked, add in the thick sauce and the cheese cubes, and stir together gently, so as not to break up cheese. If there is still a bit of wateryness, cook it off, stirring gently now and then – if not, then having mixed all ingredients, take off heat and let sit for a few minutes with lid (so cheese gets soft), then offer. Excellent feast preparation. If you prefer, young zucchini squash can be sliced (one-eighth of an inch thick) and used instead of spinach – cook them exactly the same as spinach, draining off water when necessary. Clean some young, fresh okra (not tough and stringy) and cut the ‘fingers’ cross-wise into discs one quarter to half an inch thick. Chop up an equal quantity of ripe but firm tomatoes into small bits about the same size as the okra-disks. Make a mild-medium chaunce with coriander seeds, cumin seeds, red peppers and hing, and not too much ghee. Add the okra to the chaunce and stir for a while, frying over a medium heart. While frying add moderate turmeric, salt, and black pepper. When cooked a little, add the tomato bits and stir gently for just a couple more minutes, so that tomato bits don’t break up much. Then add water enough to steam through and add lid. Let steam until water is gone and okra is just cooked through. Then add in some plain yogurt – enough to thoroughly wet the vegetables, and then let the yogurt cook out with lid off. As the yogurt-water cooks off (you stir gently occasionally as this goes on) the yogurt will vanish into the vegetables. When all free juice is gone turn off heat and offer. This can also be made including an equal portion of small-chopped eggplant, which should be chaunced with the okra. In this case, more ghee is used in the chaunce, and eggplant should be about half cooked before tomatoes added. The rest is the same. If okra pieces small, simply wash and remove stem. If longer, cut in half and split big half in two lengthwise. Make a chaunce with medium ghee and mild strength using cumin seeds, anise seeds (equal parts), red peppers and hing. Add in the okra and begin stirring over a medium heat, spicing with turmeric, salt, and a little black pepper. While cooking, if the preparation seems too dry and begins sticking, add a little water now and then – depending on the kind of pot or pan used and the condition of the okra, this is sometimes not necessary. When all okra is soft through and beginning to break up, finished. When one becomes accustomed to the unusual texture of okra cooked like this (to most people it seems a bit slimy) it becomes very relishable. Cut cleaned potatoes into cubes half inch to three-quarters inch square and an equal quantity of cauliflower into medium to small sub-heads. Make a medium-to-strong chaunce with fairly heavy ghee – using a few corianders and plenty of cumin seeds, red peppers, and hing. When chaunce is nice and ready, add first the cauliflowers and fry around a bit on medium to high heat. When just beginning to cook, add the potatoes and a fairly heavy sprinkling of turmeric, salt, and ground black pepper. Stir occasionally at this heat, allowing to brown a bit, and then stirring again. Whenever sticking becomes a problem, add in more ghee – enough so that they are always frying and browning a bit, but not sticking excessively or burning. When potatoes are soft through, cauliflowers are usually also done, and preparation is finished. Difficult to do in large quantity, but very tasty and attractive. For a larger quantity, chaunce and begin frying in this way until potatoes and spices are in. When stirring becomes a problem (i.e., burning becomes difficult to avoid) or the vegetables begin breaking up too much, then add some water and a lid and steam the rest of the way. When liquid is gone and vegetables are soft, finished. Some spicy (not sweet) masalas (spice-mixtures) are nice in this, added toward end of frying stage. Slice eggplants into cross-sectional layers not more than half an inch thick. (i.e. into flat discs or ovals). Make a powder with five parts turmeric to one part salt, and add a bit of cumin powder and hing (this may be too much salt, I don’t usually measure so I am guessing). In a flat bottomed frying pan heat up ghee about one-eighth of an inch deep. Press some eggplant flats down in the spice mixture so that coated on both sides. Now add one or more flats into frying pan (depending on its size) so that they are all flat down in ghee. Fry them over medium-high heat, moving as little as possible in the process. When golden-brown on one side, turn over and fry equally on the other side. By the time the flat should be cooked thru, and ready to offer. Every now and then, as necessary, add more ghee – they soak up plenty – and also now and then scrape all the loose spices that tend to accumulate in the ghee over to one side and remove. In this way you can cook as many as you have spice, time and ghee for. When done right, an ultimate good taste. Good vegetables to use are cauliflower, eggplant, zucchini, brussels sprouts, potatoes, spinach. Batter: put gram flour in a bowl, and add medium sprinklings of salt, turmeric, ginger powder, cumin powder, coriander powder, a little hing, and a lot of ground red pepper (it should be a little hot). Add in some water and then stir into a thick paste, beating out all lumps. Add more water and stir until a fairly thick batter is prepared. Prepare vegetables like this: cauliflowers – make into medium-small “sub heads” and steam first till almost soft through – not quite cooked; sprouts – clean and cut in half thru stem, steam similarly; eggplant – cut into squares, wedges, or flats not more than 1″ thick, zucchini (small), cut crossways into thin discs 1/8″ thick; potatoes – cut into thin wedges or flats not more than ¼” thick; spinach – break leaves up into fairly small pieces, and when dipping in batter, try to crumble several such bits together and dip – this is difficult but worthwhile. Some people also make fruit pakoras out of bananas, peaches, etc. – nice in some cases. Then heat ghee to medium-hot frying temperature, dip the bits of vegetables in the batter, and then put them in the ghee (carefully). Fry them until the batter has fluffed up, and turned a nice golden brown, and by this time, if the vegetables are properly prepared and are the right size, they will be cooked through. Then offer. An excellent breakfast preparation (being sugar-less) when properly prepared. Best vegetable to use – cabbage; others – cauliflowers, brussels sprouts, peas, indian ‘portals’; and tomatoes are optional. If using cabbage, shred (not too fine), and if others – cut into small bits or wedges. For 4 cups semolina, 7 cups water and half a medium cabbage are sufficient, also ¾ lb. butter is about right. If not frying nicely, add some of the butter, and then, when cabbage is cooked, add all the butter. When the butter is melted, add the semolina and stir. If butter quantity is right, it should become like grains for medium-to-light-butter halvah. Stir occasionally on medium to high heat until grains are lightly roasted – being careful not to burn. At the same time you are doing this, you should heat up the water (a little less than 2 parts to 1 part semolina, and less water yet if the semolina is very fine) to a boil, after adding a good bit of salt and much ground black pepper – about three times the pepper you think you should add is usually barely enough. When the grains are lightly roasted and the water is boiling, add the grains in and stir thoroughly, beating out any lumps that may try to form. It will form a cake and is then finished. This preparation has all the warming and strength-giving power of halvah without the drawback of putting too much passion-creating sugar in the brahmacari diet. It is excellent especially in cold weather, and when done right, it is usually well-liked. Is actually essential Mexican, but is first-class. Remove pits and skins from several ripe avocados, and remove skins from a few tomatoes by dipping in boiling water briefly or by scorching by rotating on a fork in a burner-flame. Smash the avocado into a paste, chop the tomatoes in small bits, and add the two together. Spice with medium salt, black pepper, thyme, and cayenne pepper. Add 1/3 cup sour cream for each cup of avocado-and-tomato, and beat all together. Finished. Best are blanched peanuts. Peanuts with dark, strong tasting skins are least desirable. I usually use 1 part peanuts to 1 part raisins. Not more than 2 parts peanuts to 1 raisins (or sultanas). Make a chaunce using a relatively small amount of ghee, and medium amounts of cumin seeds, anise seeds, dry hot red peppers, and hing. Turn the heat down low for a couple minutes as chaunce nears readiness, and then add the peanuts, stirring as you add. A hot pot or fry pan scorches peanuts very quickly. Then turn heat up to medium-low and stir almost constantly, letting the nuts sit for only a few seconds at a time, and then stirring thoroughly. Put 2 ½ gallons milk on to boil at high heat, stirring occasionally to prevent burning. In a big wok melt 4 lb. butter (have 2 ½ lb. more butter unwrapped nearby). When butter melted, add 15 cups farina and mix in. Let sit at high heat till browned, then stir, being careful not to burn. When browning too fast to keep up with, turn down heat a bit. When milk comes to a boil turn it to a rolling boil that does not boil over, and let it boil for 10 minutes or so, then add 15 cups sugar, stirring until dissolved over high heat. Bring boiling back to rolling boil. When farina gets a golden brown [toast the pecans] fully brown, add 5 cups raisins to the boiling milk and add the pecans to the farina. Not more than 5 minutes later, add the remaining butter to the grains. When the butter is melted, add the orange peel to the milk, stir for 5 seconds and then start adding the grains to the milk. Bring to boil, stirring thoroughly. Then turn off heat and stir till thick. When semolina is a few minutes from roasted, add the sultanas to the milk to soften. When semolina is golden-brown add remaining butter and stir till melted. When butter nearly melted add finely-chopped orange-rind (and nuts) to milk, then, when butter melted, add boiling milk mixture to grains and butter (or vice-versa) and stir over low heat until thick enough to suspend the raisins. After one thorough mixing, let sit off the heat (no lid till cooled) and it will form a nice cake. Melting in an additional pound of butter after mixing ingredients at end makes incredible halva. Nicest when offered warm, but also good cool. Fantastic option is to add in a spicy pineapple chutney, along with the milk, to the grains right at the end. Chaunced pineapple halva results (pineapples chopped in small bits, directions below.) Another option is to add in a good quantity of smashed fresh fruits (like strawberries) instead of orange peels, sultanas, or cloves. Fruit should go in at the last when mixing milk and grains. The final opulent option is to replace one pint of milk with cream, or even double-cream. 10 pints milk to 1 lb. basmati rice (as much as 16 to 1 ratio is possible, but in that case boil off several pints liquid from milk before beginning). Put the milk on to boil and wash rice. When the milk is boiling add the rice along with some shredded saffron (difficult to estimate quantity on saffron – it is very strong, but use enough to slightly yellow the preparation, bring the saffron to a boil in a tiny bit of water and then pour this mixture into the milk) and some freshly crushed seeds from cardamom pods (about 10 ordinary white or green pods). Adjust heat so that mixture is at slowly rolling boil, stirring occasionally. As it slowly thickens, be very careful of burning, if necessary lowering heat, and stirring constantly. Do not allow sticking to begin. When rice is soft but still a bit firm, it is nice to add about ¼ lb. thinly sliced or slivered pistachio nuts (or blanched almonds). When rice grains are extremely soft – still intact but breaking up – then add 1 lb. sugar (or less – lightly sweetened is more pleasant than very sweet in this case), dissolve it, and remove from heat. Can be offered warm or cool. This is a liquidy sweet rice (called khir or kshir). For the thicker sweet rice use more milk and boil down considerably before adding rice, or simply use more rice (6 parts milk to 1 rice instead of 10 to 1). This liquid recipe should be offered in a bowl or cup. Some use camphor instead of cardamom. If you do, be sure it’s real camphor, add near the end and be careful not to put too much. I prefer cardamom. A nice option is to utilize broken length of vermicelli noodles instead of basmati rice – cooking in the same way, but adding noodles after milk has boiled down a bit. Chutneys are delightful spicy fruit preparations. Srila Prabhupada especially likes tomato chutney, but I have seen him complement other kinds as well, including apple. About the only kind of fruit I have never tasted nice as a chutney is pear. The basic technique is generally to make a chaunce, stirring, add sugar [fruit and] sometimes raisins), and again cook down until becoming pasty. Offer warm or sometimes cool, depending on variety. Generally, sugar should be added to make the mixture appear glassy (a normally sweet chutney usually means about 3 lbs. sugar to 8 or 10 lbs. fruit), and in most cases (especially apple, tomato and pineapple), some butter should be added towards the end. Because there are so many unique varieties, I’m hoping to try and make a grape. (See chart) There are other varieties as well, these (overleaf) are [illegible] that I am not [illegible] and tamarind. [illegible] chutney is not cooked at all (according to Srila Prabhupada). Fully ripe berries should be soaked and mixed with pulp squeezed from soaked tamarind and ground black pepper – that is all. For apple chutney, I slice the apples in wedges. I leave skins on if in good condition because they usually add nice color and texture. I add citrus rind and juice and [illegible] during chauncing. Sometimes I add raisins, and usually more butter, both near the end. Srila Prabhupada likes this preparation very much, but usually does not care for apple chutney. The rosemary and thyme (and sometimes basil) are nice in tomato chutney. I remove skins by dipping tomatoes in boiling water first, or by straining at the end. Cherry, when thickened to jam consistency, made with sweet, black cherries, and made with great love and attention, is super-excellent. Ingredients: yoghurt and sugar. Take fresh yogurt and wrap it in a cloth (like muslin) that allows water but not yogurt to pass through. Suspend the cloth holding the yogurt in such a way that as it hangs, water from the yogurt drains through the cloth and into a pan. Allow to hang, dripping, for at least 12 hours (overnight generally). Then take the drained yogurt in a pot and add sugar (1 part sugar to ten parts yogurt is generally good – it should be sweet, but not too sweet). Then beat with a spoon for a long time until the sugar is dissolved and the mixture is like creamy frosting. Offer cool. Pistachio nuts, saffron, and/or crushed cardamom can be added before beating. (Saffron should be pre-boiled in a bit of water.) Or bits of fresh fruit – especially sweet ‘spring’ fruits or tropical fruits can be mixed in. Ingredients: fried chick pea flour, noodles, sugar, dried figs, raisins, chopped walnuts, candied cherries, camphor. Make a pasty batter by stirring water into sifted chick-pea (gram) flour. Beat out the lumps in this batter, and then stir in more water until you have a thick but liquid batter. Beat up about two inches of ghee (or more) in a fairly deep pan. When the ghee is just beginning to smoke, adjust the heat down to about medium. Have a colander (bowl-strainer) handy which has small holes interspersed around its bottom. Hold this colander above the hot ghee, and pour a small ladle full of batter into it. If the batter is the proper thick-but-liquid consistency it should drip into the ghee, forming into small, drop-shaped noodles. When the ghee has about ½ inch of noodles frying in it, stop dripping them, and stir the noodles to break any up which may be sticking together. If they are browning too fast to cope with, turn the heat down a bit. When the noodles are a rich golden colour and crispy, dip them out with a fine wire-mesh spoon or spoon with holes in it. Drain them for a few seconds above the ghee, and place them in a fair sized pot. Do this repeatedly until you have produced as many noodles as you want. A pound of chick pea flour should produce enough noodles for approximately 30 good-sized sweet balls. You will need to add more ghee periodically as you fry. As soon as the camphor is dissolved, pour most of the syrup and all the fruit and nuts over the noodles and stir together. Keep some syrup aside in case more is needed. (If not, use the syrup in making halvah). The noodles should become soft and sticky on the outside, but should remain a bit crisp in the middle. If they don’t appear moist enough to stick together, add more syrup (if they are too soft-mushy – I’m sorry. Next time make less syrup). When the mixture is cooled down (as it cools, it becomes stickier), squeeze into big balls, about 1 ½ inches in diameter. These balls are difficult to roll because of the sticky mixture. I find it best to keep a bowl of water nearby and to rinse my hands after every few balls. When properly made this (along with kachories) is one of Srila Prabhupada’s top favourites. Gram (chick-pea) flour, butter, sugar, icing sugar. Melt 1 lb. butter in a sauce-pan, and then add 1 lb. gram flour and mix together. Keep mixture over a medium flame, allowing to sit and begin to brown, and then stirring thoroughly. Repeat this process until the mixture is a rich golden-brown colour. Then, turn heat down to very low and add in ½ to ¾ lb. icing (powdered) sugar. Stir this in, and the result will be crumbly. Keep stirring over low heat and the sugar will melt, so that the mixture becomes again pasty. Then add the rest of the sugar, up to 1 lb. total, and stir again until pasty. Then allow the mixture to cool, and roll into balls, by spooning some nearly firm mixture into hand and then quickly rolling into a ball. Allow these to cool. Do not store laddu balls in a warm place (they melt). If you want less-sweet laddu, use less sugar and a bit less butter. Similarly, for thicker mix, use less butter. Some devotees like to add raisins or currants near the end of cooking. Many karmies like these balls. Butter, icing sugar, powdered milk. Melt 1 lbs. butter in sauce pan. When melted, add 1 lb. icing sugar and stir over medium heat until the sugar melts. Then turn off the heat. Add 1 lb. of good-quality, powdered or crystalised milk (this is the only thing I used powdered milk for – never to drink) and mix in thoroughly. Raisins or sultanas can also be added (if desired) at this point. Squeeze this mixture into balls about ¼ inch in diameter, and roll the balls in a bit of powdered milk or sugar to coat them. A very quick and popular sweet. These are the only sweets at which I am reasonably expert. Others I am not expert at are barfi (thickened milk sweets), sandesh, goolabjamons (or ‘sweet-balls’), and rasgullas. All those are also first-class when nicely prepared. So far barfi is concerned, the basic technique is to boil milk down, either plain, or with ground cashew-nut (first-class), or with shredded coconut (second-class). Sugar is also mixed in, but I don’t know the proportion. When the mixture is cooked down until thickening but still liquid, pour into a baking pan or pie-tin and allow to cool. As it cools, it solidifies and can be cut into squares. Rasgullas are made from moist curdled milk-solid which is smashed to break up the curds and then made into small balls. These balls are then boiled in sugar solution. I have never been able to adjust the cheese moisture, solution sugar proportion, and rate of boil adequately to produce the spongy, puffy, juicy rasgullas that Bengal is famous for. Very difficult. Chant Hare Krishna! Can be prepared from most juicy kinds of fruits, along with most dried fruits and nuts (excepting peanuts). After removing all seeds, pits, stems, skins, etc. from the fruit, and cutting the remaining easily edible parts into relatively small pieces, a little sugar and some kind of milk product can be added. The milk product can be thickened cream or yoghurt, but Srila Prabhupada’s favourite is sour cream. These ingredients are then mixed to form the salad. A Simpler variation is to add sugar and some lemon juice instead of a milk product. When offering plates of cut fruits (especially tangy fruits like fresh pineapples), little cups of salt and pepper can also be offered. I wonder if there is some video for learning? Hare Krishna! !